3/4 x 1 x 1 1/2 in. 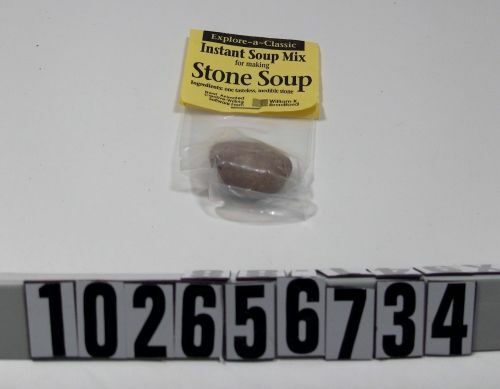 Small pebble in plastic bag with label reading on the front, "Explore-a-Classic / Instant Soup Mix / Stone Soup / Ingredients: one tasteless, inedible stone" and "New! Animated Creative-Writing Software from William K. Bradford" and on the back, "Animated Creative-Writing Software for Grades Pre K -3 / Stone Soup / The Three Little Pigs / the Princess and the Pea".